Simon Fraser University (commonly referred to as SFU) is a Canadian public research university in British Columbia with its main campus on Burnaby Mountain in Burnaby, and satellite campuses in Vancouver and Surrey. The 1.7 km2 (0.66 sq mi) main campus in Burnaby, located 20 km (12 mi) from downtown Vancouver, was established in 1965 and has more than 34,000 students and 950 faculty members. 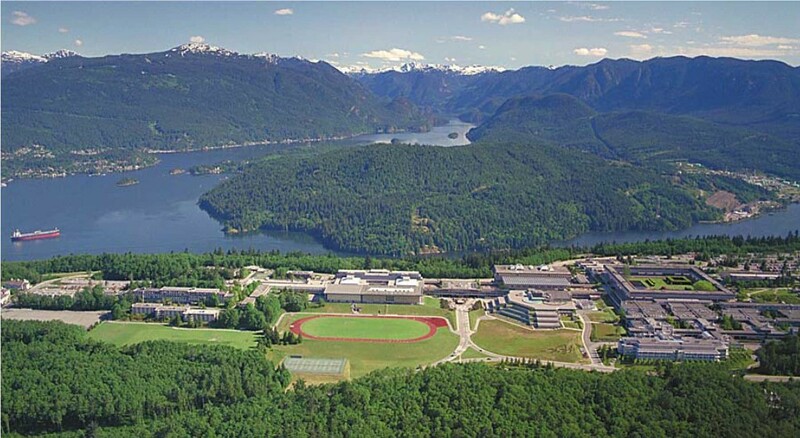 The university is adjacent to a new urban village, called UniverCity, also on top of Burnaby Mountain.The university was named after Simon Fraser, a North West Company fur trader and explorer. Undergraduate and graduate programs operate on a year-round tri-semester schedule. It is the only Canadian university in the National Collegiate Athletic Association (NCAA). In 2007, Simon Fraser University was the first and remains the only university to be awarded the Prix du XXe siècle from the Royal Architectural Institute of Canada recognizing the "enduring excellence of nationally significant architecture". UniverCity is an award-winning sustainable community located on top of Burnaby Mountain, adjacent to Simon Fraser University. It is modeled as a sustainable community. UniverCity has won several awards for sustainable planning and development.It is currently home to over 3,000 residents. In 2003, Simon Fraser University commenced construction on a new residential and commercial area occupying approximately 200 acres (0.81 km2) adjacent to the campus, atop Burnaby Mountain, called UniverCity. The area will contain up to 4,500 residential units in a number of neighbourhoods, along with a new town centre, schools, parks and other amenities. As of March 2010, approximately 3000 people lived in UniverCity. A new elementary school was scheduled to be opened in the fall of 2010 to accommodate families in the area, along with new child-care facilities. A number of new developments have taken place, including the construction of a new supermarket and several residential complexes.